- This image pair shows changes to two of the more prominent glaciers in this region. Figure 97 was acquired on September 28, 1987, by the Thematic Mapper on Landsat-5; Figure 98 was acquired on September 30, 2017, by the Operational Land Imager (OLI) on Landsat-8. Tracy Glacier (north) and Heilprin Glacier (south) are the largest glaciers draining into Inglefield Bredning, a fjord measuring about 20 km wide. - According to research published in 2018, scientists found that glaciers in this region have retreated significantly in the 21st century due to atmospheric warming. From the 1980s through the 1990s, Tracy and Heilprin glaciers retreated at similar rates, about 38 and 36 meters per year, respectively. But between 2000 and 2014, their rates of retreat diverged dramatically. Tracy retreated by 364 meters per year. That is more than three times the rate of retreat at Heilprin, which lost 109 meters per year over the same span. - The difference is likely due to the way the glaciers encounter water. Tracy Glacier flows into a deep channel of seawater (as much as 600 meters deep), making it more vulnerable to melting from below by ever-warming seawater. Heilprin, in contrast, flows into shallower water and is not thinning or retreating as quickly. - NASA's ship-based Oceans Melting Greenland (OMG) field campaign has been studying the role of the oceans in the melting Greenland's ice. At the same time, Heilprin and Tracy glaciers are among those mapped each year by NASA's Operation IceBridge, an airborne mission to map polar ice. 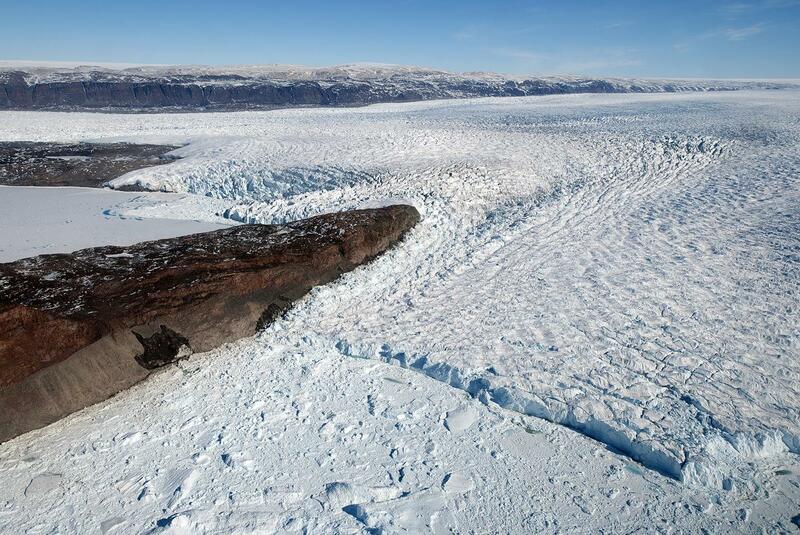 During the 2011 IceBridge campaign, scientist Michael Studinger snapped this photograph of Tracy Glacier. - Geologists call the rock at the bottom of the basin the Ga'ara Formation. It is made up of alternating layers of sandstone and soft claystone that formed roughly 300 million years ago, when the area was covered by a shallow sea. Later, types of carbonate rock (dolomite, limestone, and marl) were layered on top of the Ga'ara Formation, and the entire sequence of rock was gradually pushed up into a dome shape by tectonic forces. - The dome achieved its maximum height about 30 million years ago. Erosive forces have since chipped away at this layer-cake of rock. The combined effects of water, wind, and gravity wore through the thin carbonate layers at the top of the dome, and then hollowed out the oval-shaped depression from the soft, crumbly rock of the Ga'ara Formation, leaving behind a rim of tougher carbonates. These steep cliffs along the southern rim have played a key role in widening the basin over time. The regular stream of landslides and rockfalls that tumble down the cliffs have caused the southern rim to continue moving south over the years. - While rain is infrequent here, it can fall in intense bursts during the short wet season. These sporadic deluges can transform dried-out channels (known locally as wadis) into roaring rivers that, over time, carve the sharp valleys in the limestone plateaus along the western and southern rim. When the rushing streams drain into the Ga'ara's relatively flat interior, they spread out and become braided streams with multiple, interlacing channels that spread sediment over a wide area. - As the streams slow, their capacity to carry sediment diminishes, causing sandbars to accumulate along the channels. Over time, the channels migrate back and forth, creating fan-shaped deposits of sediment known as alluvial fans. Some of the fans, especially along the southern rim, are older and dormant; others, mainly along the western rim, are smaller and actively growing. - While geologists think rockslides and flowing water were especially influential in carving out this depression, wind played a key role as well. During drier periods, fine sand on the basin floor often gets lifted by wind storms and blown out of the basin in an easterly direction. - Nearly 1,600 km from Fiji, halfway between Australia and Hawaii, this South Pacific island is essentially a sandbar atop a coral reef atop a subsiding deep-sea volcano. The Operational Land Imager (OLI) on Landsat-8 acquired a natural-color image of the tiny island on July 28, 2014 (Figure 100). - Once named Gardner Island by American sailors, Nikumaroro is part of the Phoenix Islands in the island nation of Kiribati. The Americans and the British tried several times to colonize the island, attempting to grow coconuts and considering the spot for weapons testing. Thick scrub and stands of Pisonia and coconut palms hold the sandbar in place around a central lagoon. Kiribati declared the island part of the Phoenix Islands Protected Area in 2006. - The most famous claim to fame for Nikumaroro is that it may be the final resting place for Amelia Earhart and Fred Noonan. The pair of Americans flew out of New Guinea in July 1937 on one of the last proposed legs in their attempt to circumnavigate the world by airplane. Their intended destination was Howland Island (also part of the Phoenix Island chain), but they never made it. Radio transmissions suggested they might have missed their target by several hundred miles to the southeast. - For decades, forensic scientists, historians, and aviation aficionados have searched for evidence that Earhart landed the Lockheed Electra 10E on Nikumaroro. Many of those efforts have centered around a crest of land called The Seven Site (named for the shape of a clearing). British colonists in the late 1930s found human bones, a woman's shoe, airplane parts, bottles of cosmetics, and a box that once contained a sextant (for navigation), among other items. Later explorations have turned up evidence of campfires and of shells and fish, turtle, and bird bones that appeared to have been eaten. - But early forensic studies of the remains and artifacts were crude by today's standards and ultimately proved conflicting and inconclusive. Modern scientists no longer have access to the human bones for DNA testing. A new analysis of the old evidence, published earlier this year, concluded that there is enough evidence to call Nikumaroro the final resting place of Earhart, though the debate continues. - The connections in this drainage system, or watershed, is why the heavy rains that spurred flooding in the Midwestern United States in late February 2018 ultimately led to flooding in Louisiana in early March. What happens downriver is largely affected by what happens upriver. The pulse of floodwater on the Ohio helped deliver freshwater and a sediment plume to the Gulf of Mexico. - The recent flooding at the confluence of the Wabash and Ohio rivers is visible in this image, acquired by OLI (Operational Land Imager) on the Landsat-8 satellite. The image is a composite, showing floodwater on March 3, 2018, combined with an image acquired on November 7, 2017, that shows the typical widths of the rivers. It is false-color (bands 6-5-3) to better distinguish flooded areas (blue) from the surrounding land (tan). - John Sloan, a watershed scientist at the National Great Rivers Research and Education Center, pointed out that smaller tributaries on the west side of the image have narrower floodplains that become successively larger as the watershed becomes larger. Major rivers, such as the Ohio, have very wide floodplains. This image shows the widespread flooding that can occur in the area around the confluence of major rivers like the Wabash and Ohio rivers. - Floods can speed up the processes of erosion and sedimentation, increasing the volume and speed of the water flowing through an existing channel. During a flood, water and sediment can spill over a river's natural banks and flow into the adjacent floodplain. In the image of Figure 101, the blue area shows both the river channel and the portion of the floodplain that was flooded in early March. - As the floodwaters slow and recede, they usually leave most of their sediments behind on the floodplain. Sometimes these add organic matter and fertility to the floodplain. In other cases, land is scoured and thick sand deposits are left behind-for instance, when a levee breaks and water rushes across the floodplain. - "River flooding is a natural process," said Lois Morton, a professor (emeritus) at Iowa State University. "Floodplains provide important upstream storage, reducing river flows downstream, recharging groundwater supplies, filtering nutrients, and enriching forest and wetland habitats." - Major flooding most often occurs when heavy, persistent winter rains coincide with snowmelt because the still-frozen ground makes water run off the landscape rather than soaking into the soil. The flood this winter along the Ohio River was the worst in two decades, according to news reports, but not the worst on record. - "The winter flood of 1937 on the Ohio River was one of the worst to hit the Ohio River Valley, and the Wabash basin was a big contributor," Morton said. Waters rose to "major" flood stage north of the Ohio-Wabash confluence and inundated Evansville, Indiana. They crested well above major flood stage south of the confluence in Shawneetown, Illinois, and destroyed most of the town. Figure 101: Composite image of OLI, showing floodwater on March 3, 2018, combined with an image acquired on November 7, 2017, that shows the typical widths of the rivers. It is false-color (bands 6-5-3) to better distinguish flooded areas (blue) from the surrounding land (tan), image credit: NASA Earth Observatory, image by Joshua Stevens, using Landsat data from the USGS. Story by Kathryn Hansen, with image interpretation by John Sloan/National Great Rivers Research and Education Center, and Kenneth Olson and Lois Morton/Iowa State University. - The Ebro River drains one-sixth of the Iberian Peninsula (more than 8.5 million hectares) as it makes its way from the Pyrenees and Cantabrian mountains of northern Spain. It winds through the regions of Cantabria, Castile and León, the Basque Country, La Rioja, Navarre, Aragon, and Catalonia, forming portions of those regional boundaries and lending its name to cities and towns throughout. As the Ebro traverses these regions of Spain, it takes pieces of each—sediments, soil, and sand. When the river meets the sea, it loses velocity and deposits its sediment load along the shore, feeding the delta. - Scientists have estimated that the river first reached the Mediterranean Sea about 13 to 15 million years ago. The peculiar shape of the Ebro Delta reveals that it has had a rich morphologic history, and the delta has experienced tremendous shape-shifting recently. - Motivated by the complex shoreline, a group of researchers led by Florida State University's Jaap Nienhuis used simple models of river profiles and coastline evolution to understand the delta's development. The authors established that rapid changes to the Ebro Delta began about 2100 years ago, and their results were published in Earth Surface Dynamics. - "There is a lot of information hidden in that shape complexity that we knew might tell us something about what the delta looked like in the past," Nienhuis said. - A substantial input of sediments built and shaped the Ebro Delta. Climatic records show that flooding was initially responsible for carrying an abundant amount of river sediments to the coast. But more recent delta growth spurts can be attributed to manmade land-use changes, such as forest clearing and the conversion of land to agricultural fields, which exposed more sediment for runoff into the Ebro River. - "The Ebro, and many other deltas in the Mediterranean, were some of the first to experience significant human impacts," Nienhuis explains. "Some of the modeling we have done suggests that early land-use changes, like deforestation during the Roman Empire, could have led to its growth. In that sense, we can use the Ebro to learn about coastal response to land-use changes and the longevity of some of these impacts." - Deltas are categorized into three main groups: river-dominated, tide-dominated, and wave-dominated. Wave-dominated deltas often have a "cuspate" shape, which is created as the sea pushes the river's deposits back towards the shoreline on each side of the main channel. This leads to smooth, curving beaches that extend back to the mainland on both sides. River-dominated deltas are pointy because the river exerts itself into the sea, depositing enough sediment to sustain its river channel and outpacing the ability of waves to push those sediments back to shore. This creates "lobes" of land extending into the sea. - More than 1,000 years ago, a river-dominated Ebro Delta formed a pointy lobe known as the Riet Vell. Then, around six centuries ago, the river channel changed course (a process called avulsion) and the Riet Vell lobe was abandoned. A new lobe called the Sol de Riu began to form at the mouth of the new river channel. Meanwhile, the abandoned Riet Vell lobe was slowly pushed landward by waves to form a spit at the southern end of the delta. Like a potter working a piece of clay, the constant wave action slowly transported sediments southwest, forming the long curving La Banya spit. - An avulsion that occurred about 300 years ago moved the river channel yet again, this time abandoning the Sol de Riu lobe, which was in turn worked by waves into the El Fangar spit to the delta's north. It also formed the Mitjorn-Buda lobe that the channel still runs through today. Nienhuis and colleagues speculate that sometime during this period of rapid delta growth, former unnamed spits closed off their protected bays and created the modern Encanyissada, Clot, and Tancada lagoons. - Humans, who indirectly drove the growth of the delta over the past 2100 years, are today starving the delta. The waters of the Ebro River have been diverted for irrigation, so sediment dynamics have drastically shifted. There are now 187 dams on the river, and most sediments now settle in front of dams instead of reaching the sea. The loss of sediment deposits from the Ebro River means the modern Ebro Delta is now wave-dominated. River damming, combined with sea-level rise and land subsidence, are predicted to take their toll—40 percent of the delta could be submerged by 2100. - On June 16, 2016, the Operational Land Imager (OLI) on the Landsat 8 satellite acquired this image of the Sarawak River Delta on the island of Borneo in East Malaysia (Figure 103). The Rajang River, visible at the bottom of the image, is Malaysia's longest (563 km) and can be navigated from the South China Sea to points far inland. - The area's unique drainage patterns are most obvious in the top-right quadrant of the image, northeast of Sarikei. Here you can see the Rajang River forking at several sharp T-shaped junctions, heading at times 90 degrees from its previous path, and then turning west and resuming its path toward the sea. According to Robert Gastaldo, a sedimentologist at Colby College, this so called "T-junction splitting" is the result of faults in the Earth's upper crust. The faults cause blocks of land to drop downward, which strongly influences the path that water will take. - Not all of the rivers pictured here take such sharp turns. According to Gastaldo, the gentle snake-like turns are sculpted by the incoming and outgoing tides, which can be significant in this delta. During a king tide, water can rise and fall by 6 meters within a 12-hour cycle. Tides also influence the shape of a river's mouth. As a tide falls, or "ebbs," seawater rushes seaward. The high speed of that rushing water, combined with the normal seaward flow of river water, sculpts a funnel-shaped mouth. The Batang Paloh is a clear example of this phenomenon, where the mouth is much wider toward the ocean and narrows toward the land. - You can also see an array of colors in the waters throughout the delta. Light brown "tea-colored" water is caused by humic acids that have leached into the water from the peatlands. (The entire area is blanketed in a layer of thick peat that has been accumulating since about 7,500 years ago.) Yellow-tinged waters contain a mix of this peat and large amounts of suspended sediment. The gradient in color depends on how much sediment remains suspended in the water as it approaches the coast. - "In the 1960s, the Rajang River flowed clear with a tinge of light-brown tea water," Gastaldo said. "Once logging commenced, the high amount of rainfall in this part of the island could more easily erode the soils, significantly increasing the suspension load." - The completion of the Lower Sesan II dam in Stung Treng province will give hydropower yet another boost. At full capacity, the $800 million project is designed to generate 400 MW of electricity, making it the biggest hydropower station in the country. Water levels began to rise in September 2017, when the dam's floodgates were closed. In November 2017, the first turbine began to generate power. By October 2018, all eight turbines are expected to be operating. - OLI (Operational Land Imager) on the Landsat-8 satellite captured these before and after natural-color images of the dam and reservoir. They were built near the confluence of the Sesan River (Tonlé San in Cambodian) and Srepok River, both tributaries of the Mekong River. The image of Figure 104 was acquired on February 14, 2017; Figure 105 shows the same area on February 1, 2018. The brown and light green areas in the first image, particularly those with straight edges, were likely cleared recently for timber; some of the smaller tan areas were crop fields near villages. Densely forested areas are green. - In a country where only 50 % of rural communities have access to the electrical grid, the boost in generating capacity will help with a government-led effort to bring electricity to all Cambodians by 2022. The project is also expected to reduce the cost of electricity. - However, the dam and its 75 km2 reservoir will also have significant impacts on communities near the river. Though some communities have resisted moving, rising waters have forced thousands of people to leave their villages. Scientists have cautioned that the Mekong Basin could see a 9% drop in the availability of fish. - The dam is likely a harbinger of things to come. Plans are ongoing to add several more dams along the Mekong River and its tributaries, including two on the Mekong River that would dwarf this one. The Stung Treng dam would generate 900 MW and the Sambor Dam would generate 2,600 MW. - OLI (Operational Land Imager) on Landsat-8 collected these natural-color images of the valley on September 20, 2017. The image of Figure 106 is a detail nadir view of Figure 107, with Cayambe, a town of 40,000 people. Figure 107 features also three inactive volcanoes, lying to the north, including Imbabura (4,630 m). Bands of cloud forests (dark green) ring the lower slopes of the volcanoes. - Ecuador exports nearly $1 billion (U.S.) in cut flowers each year; the main product is roses, though baby's breath, carnations, and chrysanthemums are also grown. About one-third of the roses that Americans exchange on Valentine's Day come from Ecuador; almost all of the rest arrive from Colombia. Cayambe's rise as an epicenter of rose production mirrors the growth of Ecuador's cut flower industry. In the mid-1980s, Landsat imagery shows very few greenhouses in Cayambe. By 2000, they had sprung up on the outskirts of the town. By 2017, they were ubiquitous. The greenhouses make it possible for rose growers to precisely control temperature and humidity to minimize diseases and pests. - The valley's location along the equator makes it ideal for growing roses, which benefit from bright light, the roughly equal length of days year round, and the minimal variations in daily and seasonal temperatures. At an elevation of roughly 2,800 m, roses also grow slower than they would if grown at lower elevations, leading to larger blooms and more sugar in the stems (which extends shelf life). - Wetlands and irrigation systems provide easy access to water; some of the water supply systems date to pre-Columbian times. The valley's fertile volcanic soils are another plus, though the location at the foot of an active volcano comes with the risk of ash falls and destructive mudflows known as lahars. - "There are certainly questions and concerns about the environmental and health impacts of the pesticides used and the treatment of greenhouse workers (in particular women), but the explosive growth of Cayambe's flower industry—which nobody expected—has had undeniable benefits," said Knapp. "It has created a huge number of jobs in the area and turned Cayambe into a prosperous place." Legend to Figure 109: When OLI on Landsat-8 captured this image of Rupert Bay on July 30, 2016, tannin-stained (dark brown) river water was flowing into the bay at the same time that turbid seawater appeared to be pushing in due to the rising tide. The shallowness of the bay, some suspended mud and sediment kicked up by the tide, and mixing of the stained river water and sea water likely gave the sea water a light brown appearance. Note that the colored plumes and intricate vortices around the islands are pointing inland—an indicator that the tide was likely coming in or that northwesterly winds were affecting the flow of the water. The lowermost image shows a detailed view of von Kármán vortices formed as water flowed past a small island in the bay. - Evidence of volcanic activity surrounds the canyon. To the south, snow-capped Solimana (Figure 110), an inactive stratovolcano that last erupted about 500,000 years ago, soars above the plateau. Colorful yellow and orange volcanic deposits are visible around the north rim of the canyon. - The image of Figure 111 underscores the stark transitions in environmental conditions and vertical ecology of the canyon. The base (elevation 1200–2300 meters) is a warm, lowland zone where fruits, especially grapes, are widely grown. Higher up (2300–3600 meters), the dominant crop is maize. Farmers also raise more traditional crops such as kiwicha, quinoa, and tarwi. Potatoes and other tuber crops are grown in the cooler, upland areas (3600–4000 meters). Not much can be grown in the arid, cold climate (4000–5000 meters) at the top of the plateau, but farmers use the land to raise alpacas, llamas, sheep, and cattle. Figure 117: This line chart details how water levels in the six key reservoirs have changed since 2013. Though the reservoirs are replenished each winter as the rains arrive, the trend at almost all of them has been downward. The one exception is Upper Steenbras, which holds about 4 percent of the city's water and has been kept full because it is also used to generate electricity during peak demand. Also, the city is likely drawing down the largest reservoirs first to minimize how much water is lost to evaporation. - OLI on Landsat-8 acquired natural-color imagery of Montecito before and after the fire and debris flows. Figure 118 shows the town on January 10, 2018, after mud and debris tore through the town. The image of Figure 119 was captured on November 23, 2017, before the fire. Charred, debris-covered areas appear brown; unburned vegetation is green. Trails of mud and debris are visible along streams well south of the burn scar. - On December 15, 2017, OLI (Operational Land Imager) on Landsat-8 acquired a natural-color image (Figure 120) of the broken iceberg. An area of relatively warm water, known as a polyna, has kept the water ice free between the iceberg chunks and the glacier front. NASA glaciologist Chris Shuman thinks the polynya's warm water could have caused the rapid breakup of B-44. - The image of Figure 120 was acquired near midnight local time. Based on parameters including the azimuth of the Sun and its elevation above the horizon, as well as the length of the shadows, Shuman has estimated that the iceberg rises about 49 meters above the water line. That would put the total thickness of the berg—above and below the water surface—at about 315 meters. - This pair of false-color Landsat images (Figures 124 and 125) illustrates the extent of the changes. Forested areas appear red, urban areas are gray, and landslide debris is tan. In 1986, most of the development was in low-lying, coastal areas. By 2017, development had spread widely into mountainous areas. For instance, the town of Regent had just a handful of buildings in 1986. By 2017, it had many more buildings and a population of 28,000 people. - The images of Figures 127 to 129 highlight the shrinking and growing in the recent life of Lake Chad. The false-color images were acquired by Landsat satellites—Landsat-1 in 1973 and Landsat-8 in 2017. The combination of visible and infrared light helps to better differentiate between vegetation (red) and water (blue and slate gray). The photographs of Figure 129 were captured by the Corona reconnaissance satellite in 1963 and by an astronaut on the International Space Station in 2015. - The image on the left of Figure 130 shows the icebergs in natural color. The rifts on the main berg and ice shelf stand out, while clouds on the east side cast a shadow on the berg. The thermal image on the right shows the same area in false-color. Note that the clouds over the ice shelf do not show up as well in the thermal image because they are about the same temperature as the shelf. Thermal imagery has the advantage of showing where the colder ice ends and "warm" water of the Weddell Sea begins. It also indicates differences in the thickness of ice types. For example, the mélange is thicker (has a colder signal) than the frazil ice, but thinner (warmer signal) than the shelf and icebergs. - Ushuaia is located about 250 km southeast of Punta Arenas, Chile. The city's proximity to the Antarctic Peninsula means that NASA's IceBridge campaign scientists gain an hour of extra flight time over science targets. That's important because the P-3 aircraft being flown during this campaign has a shorter range than the DC-8 aircraft flown during previous campaigns. The map of Figure 132 represents how flights from Ushuaia might cross the Southern Ocean to observe the Antarctic Peninsula and its surrounding seas and ice. - If you were to cruise in a boat in the main part of the lake, you could count 43 islands with a total area of 66 km2, according to Zhanna Tilekova of Kazakh National Technical University, who has published research on the region's geoecology. However, those numbers can change. Tilekova noted that as water levels decline, new islands form and the area of existing islands grows. In the western part of the lake, Tasaral (north of this image) and Basaral islands are the largest. Ortaaral and Ayakaral islands are also relatively large (Figure 134). Vegetation, likely small brown shrubs (Saxaul), can grow on these islands. The white areas are likely salt pans. - OLI (Operational Land Imager) on Landsat-8 captured this natural-color image on September 8, 2017 (Figure 136). The area falls within Binzhou, a prefecture in northern Shandong Province. Seen from above, the landscape is checkered with squares and rectangles, likely aquaculture ponds and brine pools used to produce salt. Dozens of drill pads for oil pumps are visible on the right side of the image. This area falls within the Shengli oil field, the second largest oil field in China. - The image of Figure 137 shows the mountainous part of Baxter State Park, an 200,000-acre (809 km2) area of protected wilderness. The summit of Mount Katahdin rises to 1,605 m, the tallest point in the state. Vegetation growth is stunted on the mountain's upper slopes and tablelands, which appear light tan. Moving down from the tree line you start to see evergreens, and then deciduous species with magnificent, colorful foliage. When the image was acquired, leaf color was at its local peak for 2017. - The most prominent events include the Tubbs fire (between Santa Rosa and Calistoga, Figure 139), which has burned more than 34,000 acres; the Atlas fire (near Lake Berryessa, off the lower right of our image), which torched 44,000 acres; and the Redwood/Potter fires (near Mendocino National Forest, north of this scene) with 32,000 acres burned. Part of the Adobe fire (about 8,000 acres) appears in the lower right of the image, near Kenwood. - OLI on Landsat-8 captured the image of Figure 140 on September 5, 2017. Figure 140 is a wide view showing blooms spanning more than 100 km off of São Paulo state. The image of Figure 141 shows details of the bloom near Caraguatatuba. The dark colors are probably high concentrations of dinoflagellates, according to researchers at the University of São Paulo. Analyzing water samples collected from Caraguatatuba Bay and from the channel between the Ilhabela archipelago and the mainland, they identified the species as likely to be Gymnodinium aureolum. - In mid-August 2017, the burn scar was still smoldering and hundreds of palm trees had toppled over. The photograph of Figure 144, taken by Figueira, shows smoke seeping from the ground with several downed palm trunks behind it. As of mid-August, the fire had burned roughly 600 hectares of palm swamp along the river—in roughly the same area that had burned during a similar fire in 2014. Figure 143: The OLI image, acquired on Aug. 11, 2017, shows the burn scar left by a palm swamp fire in Brazil along the Peruaçu River. Rather than producing big, orange flames and billowing plumes of smoke, this fire smoldered underground in dried out, carbon-rich soil and likely peat. The fire spread slowly through soil and roots, but it was able to move up the hollow trunks of palm trees in the area and burn off the canopy [image credit: NASA Earth Observatory, image by Joshua Stevens, using Landsat data from the USGS, Story by Adam Voiland, with information from Jose Eugenio Cortes Figueira (Federal University of Minas Gerais) and Geraldo Wilson Fernandes (Federal University of Minas Gerais)]. - Satellites first detected evidence of the fire on July 31, 2017. MODIS (Moderate Resolution Imaging Spectroradiometer) and VIIRS (Visible Infrared Imaging Radiometer Suite) on Suomi NPP collected daily images of smoke streaming from the fire over the next week. OLI (Operational Land Imager) on Landsat-8 captured these more detailed images (Figures 148 and 149) of the fire on August 3, 2017. - In Figure 155, you can see that the direction of the fault follows the orientation of Tomales Bay, running from the head of the Bay through Olema Valley toward Bolinas Lagoon. - The northern remnant is the smaller of the two icefields, covering about 4,000 km2 (about a quarter the size of the southern icefield). On April 16, 2017, the Operational Land Imager (OLI) on Landsat 8 captured this rare cloud-free image of the entire North Patagonian Icefield (Figure 156). - The new crack, or "rift," is visible in these images acquired on April 15, 2017, with OLI (Operational Land Imager) on Landsat 8. The image of Figure 163 shows a wide view of the glacier, including its front—where the glacier's floating tongue meets the fjord's ice-covered sea water. The image of Figure 164 shows a detailed view of the rift. - For more than four decades, Landsat satellites have collected images of Shanghai. The composite images of Figures 167 and 168 show how cities in the Yangtze River Delta have expanded since 1984. Note how Suzhou and Wuxi have merged with Shanghai to create one continuous megalopolis (Figure 168). - The image of Figure 170 shows the northwestern Caspian where it meets western Kazakhstan. The brown areas are part of the Volga Delta. Just offshore, in the shallowest parts (only meters deep), a well-developed expanse of consolidated ice appears white. Farther offshore, a large field of old, hummocked, white and gray-white ice has detached. (When pieces of ice are pushed together, some ice is forced upward and downward into so-called ‘hummocks.') This ice is slowly drifting in a giant polynya which is covered by young, thin ice (nilas). - The image of Figure 171 shows a detailed view of the nilas ice, which appears dark. Perhaps most notable, however, is the white, diamond-shaped piece of ice parked right in the middle. "This ‘island' of white ice is most probably a piece that detached from the ice field," said Alexei Kouraev, a scientist at the Laboratory of Geophysical and Oceanographic Studies (France). He notes that a likely point of origin is the "dent" of similar size in the boundary of the white ice (mid-right in the image of Figure 170). - By January 5, 2017, solar panels covered 27 km2 of the Qinghai province in China (Figure 172). According to news reports, there were nearly 4 million solar panels at the site in 2017. The rapid expansion at Longyangxia coincides with China's fast-growing solar power sector. In 2016, China's total installed capacity doubled to 77 GW. That pushed the country well ahead of other leading producers—Germany, Japan, and the United States—to become the world's largest producer of solar power. However, those three countries (and several others) produce more solar power per person. - While the two images of Figures 173and 174 don't show much change in the development of the landscape, they clearly show the development of the technology behind Landsat's satellite sensors. The false-color image of Figure 173 was acquired on October 6, 1972, with the MSS (Multispectral Scanner System) on Landsat-1; the natural-color image of Figure174 was acquired on November 18, 2016, by the OLI (Operational Land Imager) on Landsat-8. - Finally, the images are very different colors because the wavelengths (color) of light used to compose the images are from different parts of the spectrum. Both images were composed using red and green wavelengths. The image of Figure 173, however, uses near-infrared. False-color images like this one (MSS bands 6, 5, 4) are still produced with modern instruments because they are useful for distinguishing features such as vegetation, which appears red in the top image. - To help lake managers know where to focus management efforts, researchers at the University of Georgia developed a new way to assess the distribution of Hydrilla across the lake. The project was part of NASA's DEVELOP program, in which recent college graduates and early career professionals use NASA satellite observations to address an environmental or public policy issue. On October 18, 2015, the Operation Land Imager on the Landsat-8 satellite acquired an image (Figure 177) of Lake Thurmond. Blue overlays on the Landsat image show the extent of Hydrilla that month. The map is based on a model developed by the team, derived from Landsat-8 imagery and ground-based measurements. - Hydrilla grows best under specific water and light conditions. The model accounts for those parameters, represented in this series of four images (Figure 178). The most important factor is the water's transparency (top left). By lowering a Secchi disk into the water and measuring the depth at which it is no longer visible, scientists can estimate the water's transparency. In this map, the darkest orange areas are transparent and yellow areas are turbid (murky). Highly transparent regions are more suitable for Hydrilla. - OLI (Operational Land Imager) on Landsat-8 captured four false-color images between 2013 and 2016 (Figure 179). These images were assembled using red, green, and shortwave infrared light. The use of infrared light makes it easier to distinguish between silt-laden water and bare land. Water absorbs infrared light, while plants and bare earth reflect it. As a result, areas with standing water appear blue, while bare land appears light brown. Forests are bright green; savanna is pink-brown. - In Alaska and Canada's Yukon Territory, for instance, most glaciers are so remote that speedup events can go unnoticed for months until a pilot flies over the region and reports disrupted ice, notes Mark Fahnestock of the University of Alaska. The map of Figure 180, based on an analysis by GoLIVE investigators, shows the velocity of ice in southeastern Alaska near Malaspina and Hubbard glaciers. - It also means there is a huge amount of data to process and analyze. From 2013 to 2016, Landsat-8 collected thousands of images from Antarctica alone. The globes of Figure 181 show how many times Landsat-8 passed over a given icy parcel in 2015 alone. As many as 150 to 200 images were collected over the brightest yellow and green areas, while purple areas had just a handful of useful images because of frequent cloud cover and fewer orbital passes. Due to the nature of the satellite's polar orbit, areas in the far north and south can be imaged more frequently (when there is sunlight). - Gardner has been looking closely at Antarctica, with ice velocities represented in the map of Figure 182. He is working to combine the new Landsat 8 ice-flow data with prior maps of the continent's glacier flow in the hopes of understanding decadal changes across the entirety of the ice sheet. Almost 2,000 km3 of ice flows into the Southern Ocean from Antarctica each year. - OLI (Operational Land Imager) on the Landsat-8 satellite captured this image (Figure 184) of the Kiruna mine, town, and nearby airport on October 10, 2016. The green vegetation is marbled with yellow, likely the result of birch forests and deciduous shrubs changing color. A dusting of snow whitens some hilltops in the image. The Sun's low angle on the southern horizon casts long shadows on the north sides of the hills. - Figures 188 and 189 show a segment of the barrier islands in the vicinity of Cape Hatteras National Seashore. The park's origins date back to the 1930s, when Congress authorized the creation of this first "national seashore park" in the United States. It wasn't until 1953 that the National Park Service acquired enough land to establish the park, and another five years before facilities were in place and the park could formally open. - So far, Landsat-8 has been collecting nearly 75% more science images per day than originally designed, improving the cost-benefit ratio and expanding science coverage to nearly every day-lit opportunity through most of the year. - The improved science collection tempo is enabled largely by the use of small, general-purpose command buffers in spacecraft flight software, called ROS (Relative Operations Sequences). ROS files (also called binaries, loads, or buffers), are small, temporary computer files containing a series of commands separated by defined delays, so that a single command can start the buffer and its contents will execute in a set order with predictable timing. - The ROS loads can be built quickly and easily on the ground for any purpose, and one or more can be uplinked on each spacecraft contact as necessary. The addition of a special ground software script that begins the load process onboard at a specific time also allows the relative timing of the commands to be matched to wall clock times for precise execution of these buffers. Currently, ROS buffers are used for spacecraft science recorder file maintenance, automatically resetting balky equipment, and certain types of troubleshooting and fault recovery. - The original operations concept at launch was to anticipate the need for a burn at the earliest warning, monitor until a few days before TCA (Time of Closest Approach), and evaluate the need for a burn around two days ahead of the Julian day when it would be executed, though the specific commit time was driven by the conjunction geometry and the TCA relative to the change of Julian day. A general spacecraft command load would be purpose-built to include the burn activities, including suspending science collections for the duration, and when uplinked we would be committed to performing at least part of the burn activities and losing the science collections. In preparing this early, we also committed to using best-guess information about the ΔV requirement; future changes to the ΔV would involve manual commanding and the risk of sending incorrect values. - As ROS buffers became more widely used in day-to-day operations, a new process was developed to quickly build a special-purpose, propulsive-maneuver command sequence that could be used to avoid orbital debris. The burn concept was termed an Emergency Risk Mitigation Maneuver (E-RMM); it allows the burn to take place as soon as the new orbit can be screened for other conjunctions, instead of waiting for a new spacecraft command load to be built, and therefore provides a more responsive solution in a severely restrictive timeline. The special-purpose buffer includes all the commands the FOT normally inserts into the load for a standard orbit adjust maneuver (e.g., enabling burn software, setting thruster on-time duration, and so on) that can be uplinked, changed, rebuilt, and re-uplinked several times if necessary, and that could be started or stopped with minimal impact to the science imaging schedule. This buffer is built using a special computer script that takes in "knowledge" of when the buffer will start and codes in appropriate delays so that, once the buffer is started at the planned time, key events will happen at the desired wall clock time. - As a result, FOT can plan and re-plan a burn quickly, uplink and execute the ROS buffer in a single contact, and reduce the time and uncertainty of burn planning from several days to around six hours. The use of a buffer that runs independently of the spacecraft's main command load also offers the ability to work around change-of-day and change-of-year boundaries; a clean break in science data collection from which the FOT can easily recover; and the ability to verify burn parameters quickly, maximizing the abort window. - As of spring 2016, the Landsat-8 FOT has executed two demonstration burns and a DMU (Drag Make-Up) using E-RMM products. Though we have not executed an actual E-RMM burn on-orbit using this process, our ability to do so has saved team workload and science data collection on at least six occasions through the ability to wait and see how the conjunction event develops. As the low-earth orbit regime will continue to be polluted by space debris for the foreseeable future, the flexibility of burning correctly, and only when necessary, will provide significant benefits to cost, risk, and science for Landsat-8 and its successors.